La Jolla Shores draws families to its gentle, sandy beaches near Scripps Pier, where kids love to build sand castles. La Jolla is an affluent seaside town that features world-class restaurants, luxury homes and upscale shopping. But I like La Jolla for its beaches, which vary dramatically from one end of town to the other. The northern beaches are shored up by 300-foot-high cliffs. La Jolla Shores is a beautiful mile-long beach that’s great for families. Looking like a Mediterranean beach, The Cove is one of San Diego’s most sheltered swimming spots, while the reefs south of there are some of the most exposed. I like La Jolla Shores. Adjacent to the San Diego La Jolla Underwater Ecological Reserve, this beach usually offers the gentlest waves in the summer. The north end is marked by the Scripps Institute of Oceanography. While its landmark pier isn’t open to the public, the area is a haven for intermediate surfers and bodyboarders. Families flock to this wide sandy beach. By day, the main beach is a busy swimming area popular among families, who set up elaborate base camps in Kellogg Park behind the main lifeguard tower. This grassy area is perfect for picnics. A permanent lifeguard station is next to the main parking lot at the foot of Calle Frescota. This station is usually manned from 9 a.m. to dusk daily. From there, it’s only a short walk across the beach to the shallow water, where children love to boogie board. This beach is especially lovely at night, when the glow of bonfires lights the family gatherings. If you bring your boat, small boats can be launched from the end of Avenida De La Playa. However, four-wheel-drive is recommended for the unimproved boat launch across the sand. A couple blocks away are shops where you can rent a kayak or fill your scuba tank. La Jolla Shores serves as the gateway to the San Diego-La Jolla Underwater Park. This marine park is 10 miles longs and three miles wide. It’s a diver’s paradise, so dozens of divers can be usually found prepping their gear. The area just offshore is flat and sandy. But farther out are the dark blue depths of the La Jolla Submarine Canyon that drops to 900 feet. Diving is also very popular in the southern end of the Shores. Protected by La Jolla Bay, this area is used by many beginners learning to scuba dive. Harmless Leopard Sharks often gather here, offering an exciting adventure for both divers and snorkelers. The nearby cliffs are dotted with sea caves, which attract adventurous kayakers paddling over from the beach. The annual La Jolla Rough Water Swim is held off the La Jolla Shores. The largest rough water swim in the United States, this premier event attracts more than 2,000 swimmers. The next swim will be held on Sept. 13. The La Jolla Beach and Tennis Club occupies the south end of the beach. While this club is private property, the beach is public. The club is a great place to take the family for a vacation. I like it because it’s spread over beautiful landscaped grounds. The club offers a wide range of accommodations, ranging from hotel-style rooms to spacious one-, two- and three-bedroom suites complete with a living room and full kitchen. It has a total of 98 guest rooms, including 59 oceanfront rooms or suites. In addition there are 12 lighted championship tennis courts. The tennis club provides a free tennis matching service and unlimited court time. Guests may also enjoy the heated swimming pool and par-3, nine-hole golf course. The club has a fitness center for adults. But one of the best features is the private beach area. Families can have beach barbecues right on the sand. Or just lay out in the sun and watch the kids frolic in the gentle surf. Room rates begin around $200 for a standard room, including breakfast for two. They rise from around $300 for a standard one-bedroom suite to $600 for a two-bedroom suite right on the beach. La Jolla Beach and Tennis Club is at 2000 Spindrift Drive. For more information, call (858) 454-7126 or check its Web site at www.ljbtc.com. national parks in its most popular season. discount is available for new bookings in all cabin types Aug. 23 – Sept.
apply. Details of the offer are available at http://evergreenlodge.com/latesummerspecial.html. adults or $65 for youths 12 to 14. Yosemite’s most famous attractions and its hidden gems. past spring, the Evergreen completed an expansion and many upgrades. Twenty-four new family and couples cabins were added, bringing the total to 90.
games and a toddler play area. heat, fans, private bathrooms, scenic decks, SIRIUS satellite radio. (209) 379-2606 or email info@evergreenlodge.com. available from Sept. 4 – 7.
place daily over the holiday weekend. 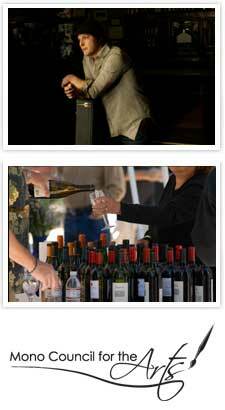 and utilize promo code LDPRRSC or call 800.401.9501.
vintners during the Wine Walk in The Village. Marcus Eaton and Jonathan Kingham. 2-8 p.m.
towering Jeffery pines. More than 30 vintners will be pouring. featuring a sampling from Mammoth’s best restaurants. 2-6 p.m.
increase by $10 – $21 a night. Camping reservations made prior to that date will be honored at the lower price. increase will have the least effect on attendance, resulting in a revenue gain. parks and reducing operating hours. pavilion in San Diego for its classic architecture. wonderful gardens and interesting museums. There’s the Museum of Man, Museum of Art, Museum of Photographic Arts, Natural History Museum — well, you get the idea. ornamentation on the beautiful facades. sister-in-law, so we each picked a museum that we really wanted to see. With so much to see, we started at the Reuben H. Fleet Science Center and worked our way down El Prado. model railroad exhibit in the world. Having built many model railroads in our home in Pittsburgh, we wanted to see this world-famous layout. They didn’t have just one model railroad, this museum featured huge model layouts in different scales. Rose Garden, Japanese Friendship Garden — well, you get the idea. My brother wanted to stop at the San Diego Automotive Museum next. He’s a car and motorcycle buff. The car museum had a very nice collection of antique cars and motorcycles. It also some hot rods and one-off vehicles. version of the 15 million Model T’s that put the world on the road. in case of a crash. I wanted to visit the Aviation and Space Museum next door. This museum has a nice range of vintage aircraft. battling German biplanes over sandbagged trenches. Another exhibit traces Pacific Southwest Airlines, the world’s first low-fare airline. PSA was founded in San Diego in 1949. The World War II section has a German Messerschmitt looping over a colorful American Mustang and British Spitfire. Jet aircraft in the collection include the Skyhawk, Hornet, Phantom and Mig 15.
everyone had enjoyed their day in the cultural center of San Diego. admission to your choice of any 4 of the 13 museums on the same day. offered by the Santa Catalina Island Company, free of charge. The offer is effective through Nov. 1. Behind The Scenes Casino Tour – New! you the stories of Avalon’s past and present. vistas to the Nature Center at Catalina’s Airport-in-the-Sky. Catalina Island’s famous flying fish leap and glide above the water. Glass Bottom Boat – Visit the Lover’s Cove Marine Preserve, where colorful fish and marine plants thrive among the kelp forests. Night-time Glass Bottom Boat and Undersea Tours – Experience the ocean world in a new light as nocturnal sea creatures come out from hiding. Casino Tour – Tour the world-famous Casino Ballroom and Theater with its fabulous murals and art-deco elegance. GPS Ranger Walking Tour – Stroll through the streets of Avalon at your own pace with your own handheld multimedia guide. Unlimited hourly tennis court rental at the Catalina Country Club. Unlimited rounds of miniature golf at the newly renovated Golf Gardens miniature golf course in the heart of Avalon. restaurant and bar, located just past the Casino Building. recitals on the antique Page Theater Organ. After taking a six-hour drive to Yosemite last year for some good old-fashioned camping, I itched for another outdoor retreat this summer. But I wasn’t looking forward to another long trek, so instead, my friends and I decided to head back to our old stomping ground — Dogwood — a little over an hour’s drive away up in the San Bernardino Mountains. Dogwood is a 93-site campground just past the quaint city of Bluejay and minutes away from Lake Arrowhead. It is operated by the California Land Management Bureau. At 5,600 feet in elevation, this little piece of the forest is surrounded by tall pine and oak trees. It’s inhabited by various forest and mountain creatures — birds, lizards, squirrels and bears, oh my! After last year’s up-close encounter at Yosemite, (a bear visited in the middle of the night to help himself to the forgotten bag of marshmallows at the bottom of an ice chest), I was not too worried about bears at Dogwood. The furry beasts aren’t as comfortable with people here as in Yosemite, so we didn’t see any during our three-day stay. But, it’s very important not to give them reason to stop by. Forget the marshmallows! Each site varies in size. The big ones can hold 16 people with picnic tables, a fire ring and parking spot. Our site, which we called Troop 50, was one of the double-sized spots and sat in a cul-de-sac, secluded from other sites. We had an entire forest behind us to play around in. We even had our own little hiking trail to explore. During the day, the sun was bright and warm, with temperatures hovering in the low 80s, though it was cooler in the shade. A full moon brightened the night sky as we gathered around our campfire to keep warm and share stories. The temperature dropped to about 50 once the sun set. Fires aren’t permitted when the fire danger is high. We didn’t need an alarm in the morning, thanks to a determined woodpecker drilling away at a nearby tree. Plus once the sun is up, your tent is like a sauna. The map shows one light trail, The Enchanted Trail, but there are plenty outside the campground. We entertained ourselves by taking a little hike on our private trail, which led to an open area of fallen and chopped down trees. Here’s where we found lots of creatures, such as the lizard that crawled up my sister’s leg. The campground offers special family programs on weekend nights. Next time, I plan on heading to nearby Lake Gregory where there is boating, fishing and a waterslide park. Only minutes away, Lake Arrowhead Village offers lots of dining and shopping. Water sports require a permit because it is a private lake. But boat tours of the lake are offered. Don’t worry about bathrooms, there are restrooms and showers spread throughout the campground. Be sure to bring your own toiletries. Dump/trash stations are located around the campsite. Trash should be thrown away before calling it a night. Food and any other scented items should be kept locked in the car. The peak camping season is from early May to late October. Fees range from $28-$58 a night. Early reservations are strongly recommended for weekends and holidays. Holiday weekends have a minimum night requirement. All other reservations should be made at least one day in advance. Same day reservations may be available. Some sites are handicap accessible, others have recreation vehicle hookups. The camping fee includes entry for one vehicle and one legally towed vehicle. There may be an extra fee for extra vehicles. There is no ATV/OHV allowed on the campground and no usage of firearms, chainsaws or fireworks. Pets must be leashed at all times. For more information and reservations, go online to www.recreation.gov or call (877) 444-6777. We had our site booked for one more day but we couldn’t sleep on nature’s bed one more night so we packed up early. If you plan it right you can enjoy plenty of nature in just a few days. personal “only in San Francisco” experiences. the number of votes received per video. participants must be 18 or older to win..